First impressions tend to last. A business card makes for a definite extension of that. Sometimes referred to as a “calling card”, it is a timeless way to establish connections and build a strong network. Over the years, aside from company or personal logos, the cards have also become an avenue for self-expression through a wide variety of designs and styles. After all, the goal is to have people remember and contact you! JoinPrint Australia knows a thing or two about just how to make your business cards stand out. Here are three key tips to ensure that your information stands out from the crowd. Right after the overall look of a card, of course, is the content: the details. Make sure that your information (name, position, number, e-mail and any other necessities) is correct and concise. Most people would reach for a card and remember you quicker for one of two extremes: keep it simple or think way outside the proverbial box. This also applies to the design! Details in design can include the color scheme and the logo. If you’re already using the logo of your place of employment, great! There are many freelancers and sole proprietors, on the other hand, who make use of imagery to boost their personal brand. It’s always important to make sure that whatever design you wind up with reflects you and your work in a way that you’re comfortable with for the long run. Colors are also a very important detail! Black on white is the most basic form, but it’s definitely not a necessity. Some employees of colleges choose their school colors for their card to represent school spirit and in the same vein, certain companies will want to emphasize their branding by using a specific color or two that gives good brand recall. Sometimes, what looks good on a computer screen doesn’t translate to a good print. Black text on a dark blue card or vice-versa, for example, is a tricky combination of colors probably best left for other printing matters. While the usual business card is the default rectangular paper, modern technology allows for much more creative space to switch things up. Rounded corners are a perfect example of an underrated new design style that can really make your cards leap. It’s a lovely, subtle touch that’s definitely going to be noticed by each and every person you hand it out to. And you can combine design ideas in a single card! Rounded corners can be combined with gradient color schemes, for example. Cards printed on plastic can be made transparent or frosted. A custom die-cut will definitely add a unique touch. It is also absolutely possible—and adds quite the unique touch—to have a card that includes a full or partial pop-up feature. You can also look into getting a foil stamp on each card, or even get details embossed! Size can also be a factor. If it’s just your name and number, a square might just suffice—and the space you save for others will definitely be remembered. Another good, unconventional yet really simple change is keeping the rectangle shape, but having the layout of details vertically oriented instead of the run-of-the-mill horizontal. A little known fact is that there are actually many kinds of paper to choose from in printing. There’s the basic bond paper, glossy paper (sometimes also called “gloss-coated”) that’s generally used for brochures, matte-coated paper, and so on. 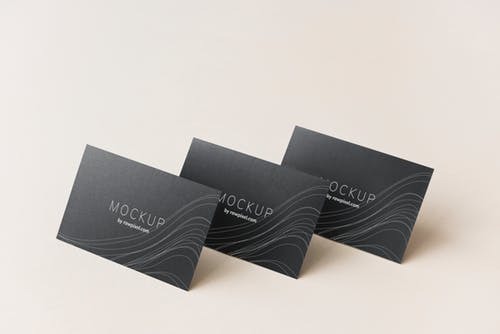 When it comes to business cards, the standard is something called cardstock. There are text stocks and cover stocks. The former is closer to regular paper, while the latter has a closer resemblance to cardboard. The thinner stock is more prone to damage from water and other external factors. The thicker stock, however, is more expensive but it lasts longer and will certainly have a better feel. A recent trend has seen the rise of plastic calling cards—trendy, easier to play with, can be made transparent. Another reason why plastic cards suddenly gained some traction in terms of business cards is that they are essentially waterproof. If you want to stick to paper, you can certainly look into multiple options. Don’t forget to choose the right finish, either—the overall feel can make all the difference! You can choose the glossy finish, a matte finish, or just go with an uncoated finish. The last option, however, means your card will be largely unprotected but have beautiful, rare texture. All that said, it’s best to collaborate with a trusted printing company. To get the best results, use these tips so your business cards make a mark!